Just Jingle: If You Obey All the Rules You Miss All of the Fun! 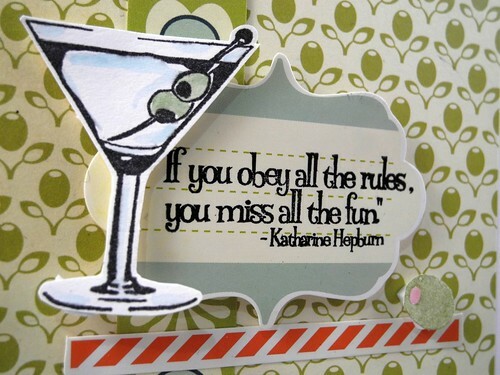 If You Obey All the Rules You Miss All of the Fun! It's time for another fabulous Skipping Stones Sketch! I had some fun with this one and turned it on it's side to create a totally new design. 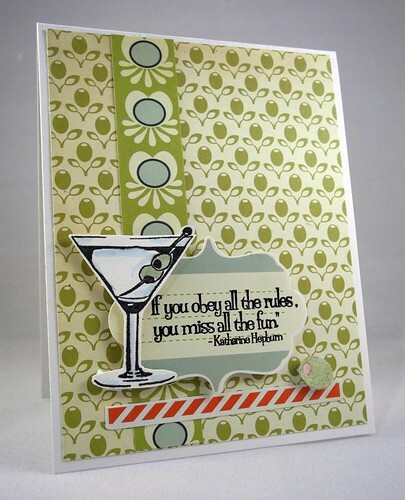 I pulled out my wicked crazy fun Martini Chic stamp set and some Cosmo Cricket papers to create this fun card! I love it!!!! That quote it just too fabulous and comes from an absolutely fabulous source, too, making it, well, even more FABULOUS!!! YAY for super fun girlfriend type cards!!!! This one is just perfect for a girls night out invitation, which is why I'm also entering into the CARDS challenge! Very cute - love the quote! what a fun card...love the quote..
How fun is that?!?! Love the pop of red on there! Not a martini drinker -- but do love olives! Yum. Love the olive paper!!! so cute!!! love the glass even though I don't drink LOL!!! Super cute as always!!! How cool!! Loving that quote (gotta write that one down!)!! Kate Hepburn ROCKED! And so does your card! Guess what ELSE? I decided - gasp - to TRY a card this week. Just. One. More. Time. LOL! Bad or good (expect WORSE than bad - I'm not being pessimistic, just REALISTIC) - I'll show you. Privately. It should give you a good laugh. Or make you ill. So be warned. In the next couple of days I'll email you a photo of ... the card! HAHAHAHA! For now, I'll simply admire YOURS! This card is su-pah fun! Love your colors. Way to rock the sketch!!! Wow, is that paper just too perfect! Awesome card, Jen! Love this fun, fun card, Jingle! That patterned paper works perfectly with the little olives! Wishing you luck in the challenge! are those olives on that paper too? what a fun card! so cute...love it! Heather makes the greatest stamps! This is just perfect!